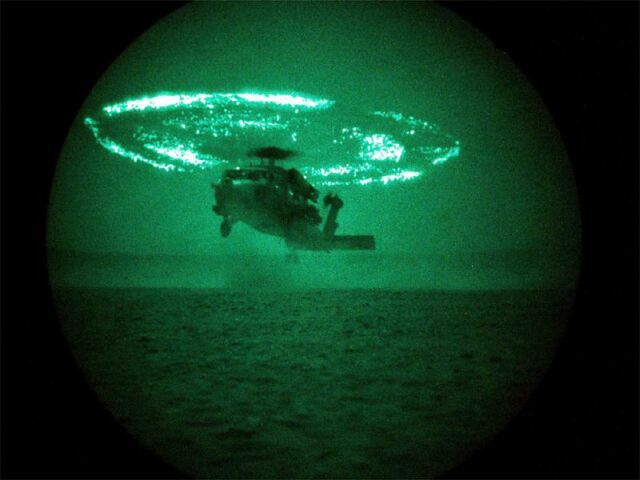 Kuwait City, Kuwait, 10 August 2000  The rotors of an SH-60 Seahawk helicopter from the "Red Lions" of Helicopter Anti-Submarine Squadron One Five (HS-15) are illuminated by sparks as the blades strike the blowing sands. The Jacksonville, Fla.-based squadron, embarked on the aircraft carrier USS George Washington (CVN 73) was in Kuwait to practice landings in a desert environment. U.S. Navy photo by Photographer's Mate Shane McCoy.